I think I pretty much summed it up in this column I wrote for Philyl Mag a few months ago. If you haven’t already read it, please do. I honestly think it’s one of the best pieces I’ve ever written. Hey Marvis we loved your DAD in our household other then ERNIE SHAVERS nobody had a left hook even close to DADS. I had the pleasure of meeting your DAD a couple of times we were all friends with HOWDY RIDDELL & his band, through him I met and got an 8×10 autographed picture of my hero SMOKIN JOE, I was so sorry to hear of his passing, truly a sad day in boxing. ROCKY. You’re confusing underrated with unloved. He had very few lovable qualities. He sued everyone (and generally lost) the list includes his real estate developers, the Oneida Indian Tribe, the boxing hall of fame and even his daughter. He spewed venom about Ali in his book. Those wars made him not beating on Jimmy Ellis. The Rocky thing is a joke and you’re sentiment as well as Bill Burrs is common among non-natives who confuse the movie cultural icon with a sports icon. Matthew Saad Muhammad or, including Camden as Philly, Dwight Qawi would both of been better boxing choices in this category. Mike, thanks for commenting. Here’s what kind of guy Ali was: when he couldn’t fight due to Vietnam he ran out of money. 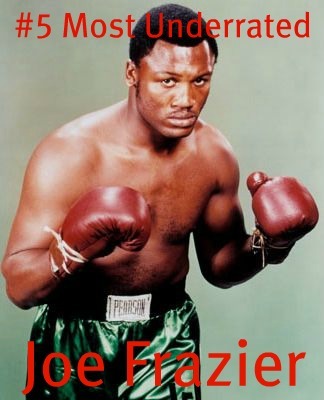 Joe Frazier let him borrow several thousand dollars and never asked for it back. Then a few years later, Ali calls Frazier an Uncle Tom, which is probably the most vicious slander an African American can call another black person. If you personally let a friend borrow money when they were down and out, then they called you a m***** f***** once they got back on their feet, do you think you would handle it diplomatically and tell everyone what a great person they were? I hate to hear anything negative about Joe – I adore the man. No matter who he helped, how many fights he won, etc, he always had to stand in the shadow of Clay/Ali and never getting any real love or recognition. I will be visiting his grave this Sept when I go to Philly and I proudly walk the streets of Brooklyn with my ‘Sharp as a Razor ‘ Frazier t-shirts. RIP Champ !